Mermaid Art by Australian Artist Anne-Marie Broughton. 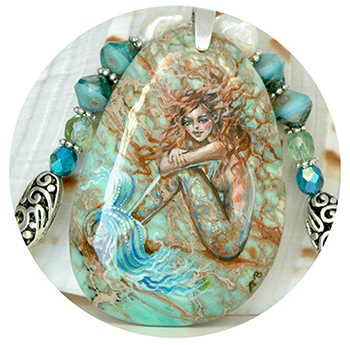 Are you looking for stunning one-of-a-kind hand painted Mermaid Art Jewellery, like wood bracelets and shell or stone pendant necklaces? Please see my Art Jewellery page. Click on the Shop link to buy Mermaid Drawing Art Prints, Mermaid Party Tail Printables, Hand Painted Mermaid Shell & Stone Pendant Necklaces, Original Hand Painted Wood Bracelets and Wood Keepsake Jewellery Boxes from my mermaid gift shop. Follow me on Facebook for regular updates, availability and special offers. All artwork on this site is ©Copyright Anne-Marie Broughton. Do not copy, paste, alter, link to, use, edit or in any way reproduce any artwork on this site without prior permission from the artist.